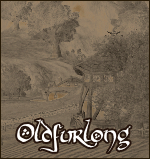 Oldfurlong, a nice neighbourhood for a visit or as a residence. This must have been the thoughts of the Aleford Sisters, Miss Gennetta and Miss Allegretta, when they decided to buy a burrow there with the aid of our excellent home-broker Andy Brockhouse. Now that they have decorated it to their hearts’ content and made it a true home, the Sisters would like to invite all their friends and acquaintances to a burrow warming party. All are welcome! The party is for all comers – no matter what race. So come to Oldfurlong, 4 Wending Way on May 25th. They envisage starting at 8pm. The Alefords will be playing some of their music and hopefully will collaborate with others*, but there will be room for other musicians to play and dance. And it goes without saying that there will be plenty food and drinks for the guests. We hope to see you then in Oldfurlong! * The idea behind this is, that the Aleford Sisters are hoping to share some 'sheet music' (abc-files) which would mean that they might be able to do a few tunes with some of the other players - a sort of “Travelling Bilberries” thing. Work has been started on a couple of pieces for a larger group than the two sisters.